The past 12 months has seen NY State hip hop producer Frost Gamble emerge as one of the fastest rising names in the game. Now relocated to Winnipeg, Canada, he signed with Miami’s 22 Entertainment on the back of his track “Honey” with Detroit rapper ZotheJerk being included in the label’s “God Bless Dope Rappers” compilation which included Royce da 5’9″, Crooked I, Kid Vishis and Horseshoe Gang in January 2016. Currently working on remix projects for Royce da 5’9″ and Horseshoe Gang, his new solo album “I Missed My Bus” which includes guest artists KXNG Crooked, Rah Digga, Skyzoo, Ruste Juxx, Guilty Simpson, Ras Kass and many more is due out in the first half of 2018. All of his releases with 22 Entertainment are available from the label’s BANDCAMP store. “Respect Is Earned Not Given” is also available from Amazon, iTunes and Spotify on CD, digital mp3 and streaming formats. Chop & Frost release a new animated video for the album track “Bing Stories” next week and are then in New York City October 16th & 17th meeting with media including a guest appearance with DJ Eclipse on his Sirius XM “Rap Is Outta Control Show”. For anyone outside of the UK unaware, SBTV have developed in the past few years from a website uploading freestyles from new upcoming artists in London to the biggest youth broadcaster in the country, with a mix of exclusive videos, interviews, & news covering independent homegrown artists to Major international established names. 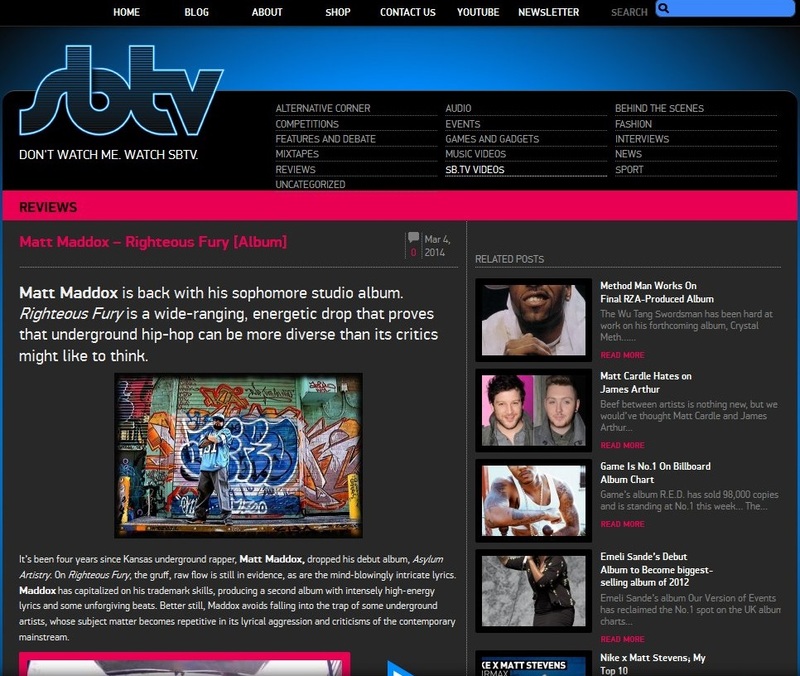 Developed by young entrepreneur Jamal Edwards, the site has grown in its range of reporting to now include reviews, and they are the latest to endorse the new album Righteous Fury by west coast rapper Matt Maddox. Released on 25th February through Red Phone Records / Seven 13 Music, it has already enjoyed a wide range of international media coverage reflecting the quality of lyricism on display from the emcee himself, assisted on mic duties by Tragedy Khadafi, King Magnetic, Reef the Lost Cauze, Adlib, Burke the Jurke and many more, including the UK’s Edd Bundy.